An 80 year old woman was referred in 1995 to the haematology outpatient department with a normocytic anaemia and weight loss. She was found to be deficient in iron, folic acid, and vitamin B12 and was started on replacement treatment. A barium meal and enema were normal and antiparietal cell antibodies negative. In 1997 she fell, fracturing her right proximal ulna and distal humerus. In April 1999 she developed intermittent diarrhoea and lost further weight. There was no rectal bleeding. A sigmoidoscopy, rectal biopsy, and computed tomography pneumocolon were all normal. In September she was referred to the rheumatology outpatient department with a three month history of painful swollen ankles, chest pains, and generalised weakness. Her bowel habit had returned to normal. She continued on folic acid 5 mg/day, hydroxycobalamin 1 mg/month, and ferrous sulphate 375 mg/day, and was taking diclofenac 25 mg twice a day for her pain. On examination she was cachectic. She was not clinically anaemic and there was no lymphadenopathy. There was a 2 cm tender liver edge but the remainder of the abdominal examination was normal. Both ankles were swollen and tender (fig 1). There was a fixed flexion deformity and the right elbow and mild weakness of the proximal musculature. There was tenderness of the chest wall, but no muscle tenderness. Bilateral ankle swelling and proximal muscle wasting. Initial investigations showed a haemoglobin of 124 g/l, mean corpuscular volume 92 fl, white cell count 10.4 × 109/l, and platelets 558 × 109/l. The erythrocyte sedimentation rate was 30 mm/hour and C reactive protein 1 mg/l. The red cell folate was low at 92 μg/l (normal range 150–700) with a normal vitamin B12 of 254 ng/l (160–800). Iron studies were normal, as were the serum electrolytes. The adjusted calcium was 1.51 mmol/l (2.15–2.65) with an albumin of 34 g/l (33–47), phosphate 1.2 mmol/l (0.8–1.4) and alkaline phosphatase of 323 U/l (30–130). Her liver function tests, immunoglobulins, and creatine kinase were all normal. Radiographs of both ankles are shown in fig 2. An ultrasound revealed a liver normal in appearance, extending below the costal margin. Dual energyx ray absorptiometry confirmed severe osteoporosis with a T score at the hip of −3.74 and at the lumbar spine of −5.64. What would be the most useful diagnostic test to confirm this? What is the likely cause of the ankle arthropathy? Which other arthritides particularly affect the ankle joint? Q1: What is the most likely diagnosis? The most likely diagnosis is coeliac disease leading to osteomalacia and osteoporosis. This patient had a serum vitamin D of 7 nmol/l (15–100). There was secondary hyperparathyroidism with a serum intact parathyroid hormone of 25.69 pmol/l (1.05–5.26). She was treated with a single dose of calciferol 300 000U intramuscularly, together with calcium carbonate 1 g/day and oral cholecalciferol 800 U/day. Her chest wall pain settled rapidly and marked improvement in objective proximal muscle power was seen. Q2: What would be the most useful diagnostic test to confirm this? The most useful diagnostic test would be duodenal or jejunal biopsy. The biopsy showed total villous atrophy, crypt hyperplasia, and an intraepithelial infiltrate of lymphocytes (fig 3). Her antigliadin antibodies were strongly positive (IgA 81 reference units (RU)/l, normal <25; IgG 200 RU/l, normal <25), although her antiendomysial antibodies were negative. 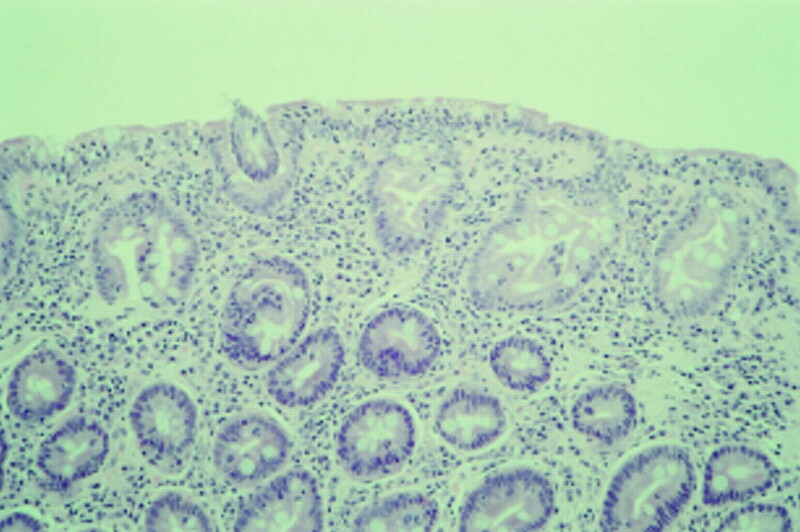 Duodenal biopsy showing total villous atrophy and an intraepithelial infiltrate of lymphocytes. Q3: What is the likely cause of the ankle arthropathy? The most likely cause is coeliac associated oligoarthritis. Ankle radiographs showed osteopenia only. The patient was started on a gluten-free diet and her ankle pain and swelling settled after two months. Her serum calcium, vitamin D, and red cell folate are all now within the normal range and the titres of the antigliadin antibodies have fallen, suggesting compliance with the diet. She has gained some weight. No other joints have become painful. Q4: Which other arthritides particularly affect the ankle joint? Arthritides with a predilection for the ankle include sarcoidosis, rheumatoid arthritis, juvenile chronic arthritis (both pauciarticular onset and systemic onset disease), and gout (box 1). Arthritis associated with inflammatory bowel disease. Coeliac disease has an incidence in England of about 1:1500.1 This appears to be increasing with a shift toward an older age at diagnosis. In adults women are affected twice as frequently as men and tend to present a decade earlier, with a peak incidence in the fourth and fifth decades. Presentation beyond the age of 70 is rare. Gastrointestinal symptoms usually dominate the clinical picture, but up to 50% of adults have a normal bowel habit at diagnosis. 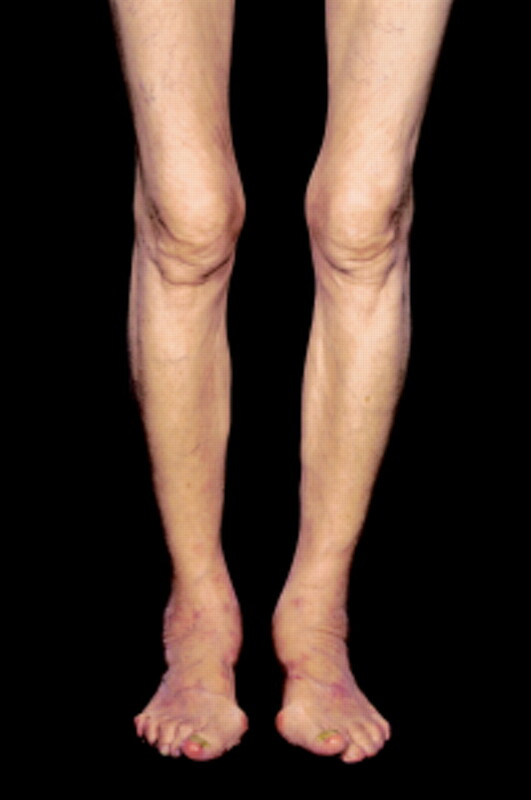 As many as 20% of adults with coeliac disease may present with one of its musculoskeletal complications (box 2), the most common being metabolic bone disease.2 Generalised arthralgia is another common feature, and this may be present for several years before the diagnosis is made.3 Fatigue and muscle weakness may be profound, due in part to hypokalaemia seen in patients with chronic diarrhoea. Clubbing is seen in 15% of untreated patients, but it is not usually associated with the underlying risk of T cell lymphoma. Metabolic bone disease: osteomalacia and/or osteoporosis. Coeliac associated arthropathy: peripheral oligoarthritis and/or axial disease with sacroileitis. Associated autoimmune rheumatic disease—for example, primary Sjogren's syndrome. Adelizzi et al were the first to note an association between coeliac disease and arthritis.7They reported a 28 year old man with a non-erosive, asymmetrical seronegative oligoarthritis affecting his knees and ankles that resolved after the institution of a gluten-free diet. Later, a series of six patients with coeliac disease in whom arthritis was prominent at presentation was described.3 In this group, age range 20 –60, arthralgia predated the diagnosis of coeliac disease by up to three years. Three patients also had osteomalacia and two a proximal myopathy. Only three patients had gastrointestinal symptoms, but all had a low serum folate. The joints most commonly affected were the shoulders, hips, knees, and ankles. The arthritis in five patients responded to a withdrawal of gluten from the diet, total remission occurring in three within three months. The arthritis of coeliac disease is usually non-erosive and self limiting, but progressive erosive disease can occur. In a case similar to ours, a 42 year old woman presented with a one year history of ankle pain and was found to be anaemic with a low serum iron, vitamin B12, and folate.8 Osteopenia and soft tissue swelling were seen on the initial radiographs but she later developed erosions in the tarsus that progressed despite a gluten-free diet. In a larger case-controlled study of 200 patients with established coeliac disease, arthritis was found in 26%.9 Of these 36% had a recurrent asymmetrical oligoarthritis affecting mainly the shoulders, elbows, knees and ankles, while sacroileitis was found in 29% (80% unilateral), demonstrating some similarity to other enteroarthritides. Some autoimmune rheumatic conditions also appear to be associated with coeliac disease,10 the most common being primary Sjogren's syndrome. Coeliac disease complicated by osteomalacia, osteoporosis, and oligoarthritis. Coeliac disease in adults may present with a musculoskeletal complication in up to 20% of cases. Coeliac disease may rarely cause an oligoarthritis affecting larger joints that usually responds to a gluten-free diet. Adult patients with coeliac disease may have a normal bowel habit. Though rare, coeliac disease can present in the elderly, an underlying malignancy being the most likely differential diagnosis. Coeliac disease is a cause of an unexplained anaemia with multiple deficiencies. The serum folate is a sensitive screening test. (1995) Coeliac disease in adults. Bailliere's Clin Gastroenterol 9:329–350. (1991) Clinical features of adult coeliac disease in Italy. in Coeliac disease: 40 years gluten free. eds Mearin ML, Mulder CJJ (Kluwer Academic Publishers, Dordrecht). (1985) Arthritis and coeliac disease. Ann Rheum Dis 44:592–598. (1998) Celiac sprue and refractory sprue. in Gastrointestinal and liver disease. eds Feldman M, Scharschmidt BF, Sleisenger MH (WB Saunders, Philadelphia). (1988) Bone mineral metabolism in adult coeliac disease. Am J Gastroenterol 3:274–277. (1996) Reversal of osteopenia with diet in adult coeliac disease. Gut 38:322–327. (1982) Celiac disease: case report with an associated arthropathy. Am J Gastroenterol 77:481–485. (1994) Persistent monoarthritis and occult coeliac disease. Postgrad Med J 70:51–53. (1996) The arthritis of coeliac disease: prevalence and pattern in 200 adult patients. Br J Rheumatol 35:1314–1318. (1992) Rheumatic complaints as a presenting symptom in patients with coeliac disease. Scand J Rhematol 21:20–23.